Hundreds of Palestinian political prisoners are now approaching their critical sixth week on hunger strike, and they have made an urgent appeal for international solidarity. 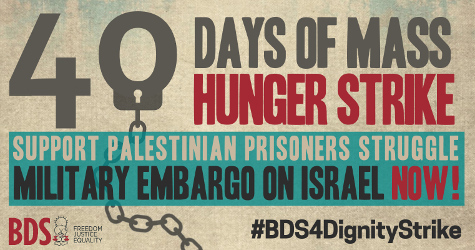 As they hit Day 40 of their courageous Dignity Strike on May 26, the Palestinian BDS National Committee (BNC) calls for intensifying global Boycott, Divestment and Sanctions (BDS) campaigns to amplify the prisoners’ legitimate and just demands. In particular, the BNC calls for immediate international action toward implementing a comprehensive military embargo on Israel, similar to that imposed against apartheid South Africa in the past. 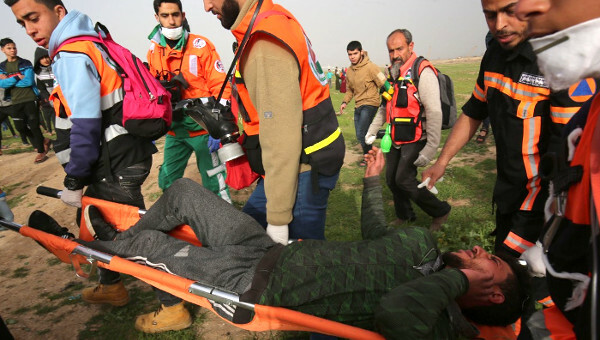 International bodies – including banks, private military corporations, research centers, universities and governments – must stop enabling Israel’s military and security apparatus, and stop facilitating the development of Israeli military technology. As long as military ties continue, the international community is effectively sending Israel a clear message of approval to continue its severe violations of international law, including its violations of basic prisoners’ rights. This is a critical moment – with every passing hour, Palestinian hunger strikers are risking death. Their health is rapidly deteriorating as they maintain their commitment to assert their dignity and win their internationally recognized rights. 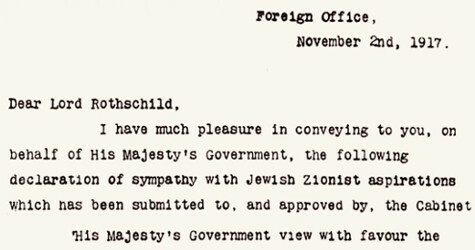 A comprehensive military embargo on Israel is long overdue and as urgent as ever. Palestinians have come together in remarkably strong support of the Dignity Strike. 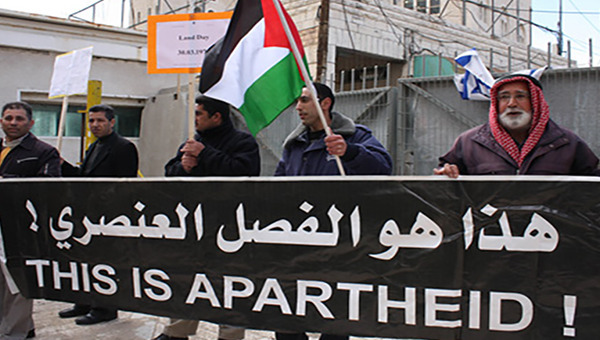 There have been two general strikes with mass participation across historic Palestine. The general strike on Monday, May 22 was the largest since the first Intifada (1987-1993). Rallies and creative actions are happening on a daily basis in Palestinian refugee camps across the region. Those living under Israeli military occupation are also demonstrating in the streets, shutting down Jewish-only settlers’ roads, bringing work and traffic to a standstill and refusing the entry of Israeli products into supermarkets. Across solidarity tents the slogan “boycott your jailer” rings loud. International action is needed to support and sustain these inspiring grassroots mobilizations as Israel has responded with its predictable use of brutal military force and repression. At least one demonstrator, 23-year old Saba Abu Ubeid, has been killed by an Israeli sniper. A second young man at a solidarity march was shot in the head by an Israeli settler. 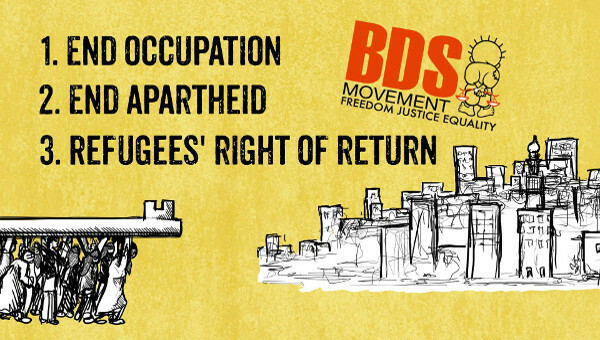 Join the #BDS4DignityStrike social media campaign. 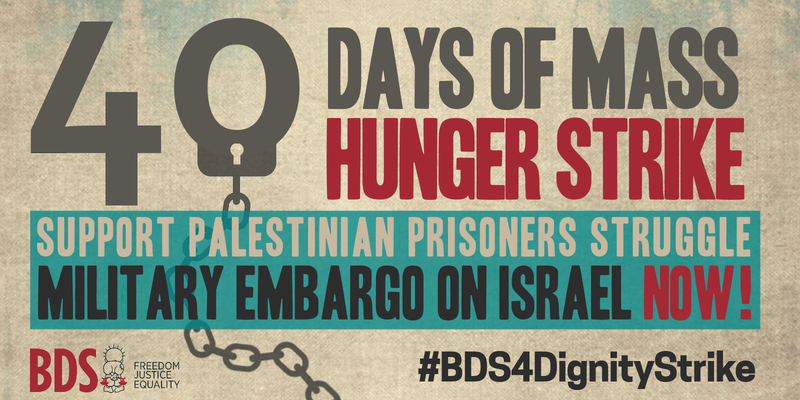 Share this image widely using the hashtag #BDS4DignityStrike. Organize a banner drop or street action in your community or campus to raise awareness about the Dignity Strike and call for a military embargo. Use #BDS4DignityStrike to share pictures from your action. Do your research and launch a divestment campaign. Your bank or pension fund are likely to have collaboration with Israeli military companies. Pressure them to divest. Start a campaign for your university to cut all ties with Israel’s military industry. Universities often conduct joint military or dual-use research with Israel or with weapons companies that supply the Israeli military. Write to your elected officials, multilateral bodies and the UN to raise the issue of the Dignity Strike and build pressure to exclude Israeli military companies from contracts and eventually impose a military embargo on Israel. Create your own BDS-related action. Don’t limit yourself to this list. “We urge all labor organizations and workers’ movements to express their solidarity and support for the Palestinian prisoners’ hunger strike, for the Palestinian people’s struggle for liberation and for the campaign for boycott, divestment and sanctions against Israel.” — Palestinian Trade Union Coalition for BDS (PTUC-BDS), April 28, 2017. But the Israeli government – which receives $3.8-billion per year in U.S. weapons and closely coordinates with the same police agencies that systematically terrorize Black and Brown communities in the United States – threatens to force-feed the strikers, and is gunning down their supporters in the streets of Palestine. Such relentless state violence reflects the continuing Nakba, Israel’s 69-year-old ethnic cleansing campaign against the Palestinian people. Labor bodies around the world have risen to their defense, including the Congress of South African Trade Unions (COSATU), Canadian Labour Congress, 26 European trade unions and labor organizations, World Federation of Trade Unions (representing 92 million workers in 162 countries), and International Trade Union Confederation (representing 181 million workers in 163 countries). 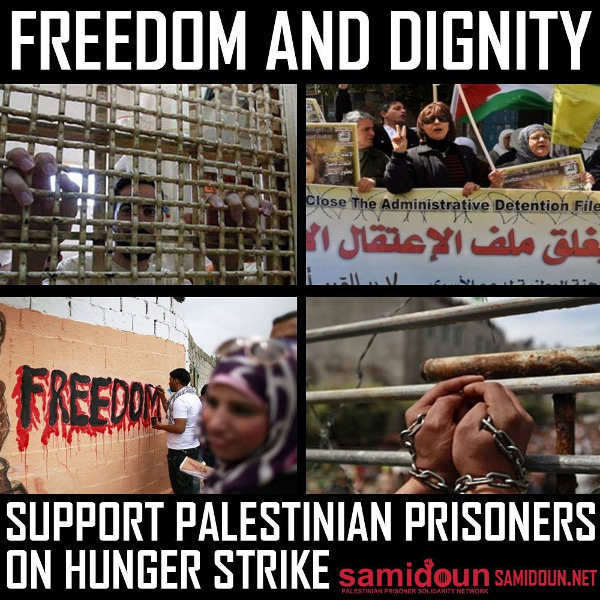 * Victory to Palestinian Political Hunger Strikers! Issued May 21, 2017 by Labor for Palestine Co-Conveners: (Affiliations below for identification only) Suzanne Adely, Global Workers Solidarity Network; Michael Letwin, Former President, Association of Legal Aid Attorneys/UAW Local 2325; Labor for Standing Rock; Clarence Thomas, Co-Chair, Million Worker March; Executive Board, ILWU Local 10 (retired).